VietNamNet Bridge – The Vietnam Football Federation (VFF) has decided to resume the name of the national football championship and the First Division. From the fifth round, the name “Super League” will be rejected. In a dispatch sent to the Vietnam Professional Football (VPF) Company, which runs the two professional football leagues in Vietnam on February 7, VFF asked VPF to resume the name V-League for the national football championship. Meanwhile, the First Division tournament, which has been called “V-League” for four rounds, will be the First Division again. VFF’s dispatch is the following step of the General Department of Sports and Physical Training’s request to resume the old names of the two professional football leagues. Earlier, the general department asked VFF to resume the name V-League, not using the new name Super League any more. It reasoned that the name of the national football championship is the significant factor to define the origin of the country where the tournament is held and the name must be in the language of that country. The old names will be resumed as of the fifth round, which will begin on February 11. Thus, the name Super League was only used in four rounds. General director of the Song Lam Nghe An Football JS Company, Nguyen Hong Thanh, said that the change of names will make difficulties for FCs and stadiums because they would have to replace advertisements, banners, jerseys, schedules, tickets, etc. which have already had Super League logo. 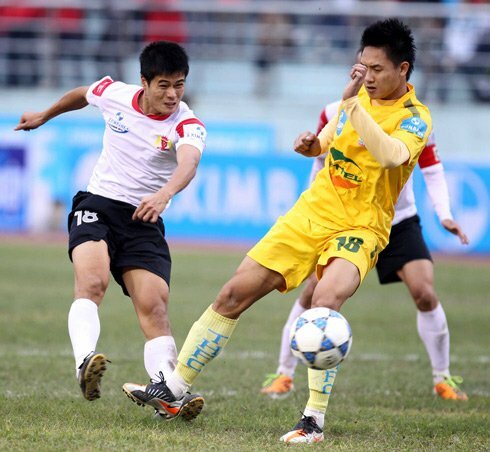 Football player Nguyen Minh Phuong of SHB Da Nang FC, said that the name is not important in comparison with football quality. In its dispatch, VFF also told VPF to continue running the two football leagues under the Regulations 2011, not the new one.